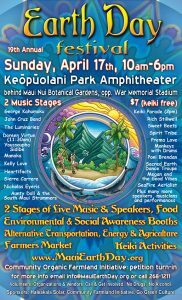 It’s that time of the year again and many are looking forward to the 16th annual Maui Earth Day Festival at Keopuolani Park Amphitheater in Kahului; a perfect, cosy location for this family event that offers a carefully thought out blend of entertainment, information and community spirit. 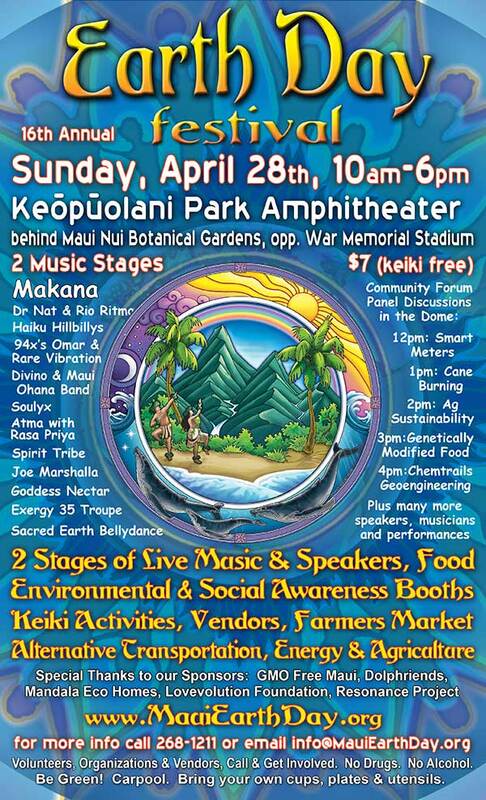 The festival aims to bring the Maui community closer together by offering an active dialogue on the environmental issues that are going to shape our future. Two stages of rousing live music and speakers will set the platform for this activity. 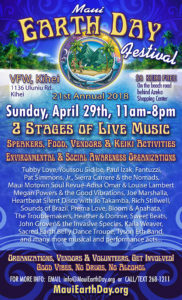 Beyond the stirring melodies and conscious vibes from soul-enriching acts such as ‘Makana’ there will be plenty to inspire: from healthy food and over 40 Environmental & Social Awareness booths, to creative Keiki activities, divinely delectable vendors and mindful advice on alternative energy, transportation and agriculture. Adults will be able to dance their way into the colourful crowds and conversations, and the kids can either set off on a pony ride or meet furry friends in a petting zoo. 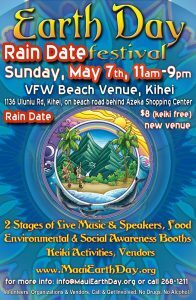 Earth Day Festival opens up conversations centered around how to protect, sustain and even heal our island and Mother Earth. Inspired talks and discussions will help all to see that our voice and our choices matter. Five Community Forum Panel Discussions will fuel the discourse on current Maui issues, starting at noon with Smart Meters, 1pm Cane Burning, 2pm Agricultural Sustainability, 3pm GMO Genetically Modified Food and 4pm Chemtrails & Geo-Engineering. The festival is held in gratitude for the beauty of our islands and the planet and promotes a focussed and informed ecological movement, to protect and nurture these precious ecosystems. The festival’s organisers recognise that Maui is at the heart centre of this movement and around 2000 people are expected to set the positive global pulse and celebrate in Keopuolani Park. It is a day where everyone is encouraged to share their passion and appreciation for the Earth and make a contribution towards a healthy future. Earth Day offers inspiration and fun for everyone. Open hearted people share much Aloha, enjoy love and laughter, and plenty of dancing can be expected. At the same time Earth Day creates a focus for a combined and collective positive energy for a realistic future of eco-consciousness. By coming together on this day, the island of Maui can be the change we all wish to see in the world. You can be that drop that creates a ripple effect throughout the coming generations and you can create a wave of change. Be there and be a part of it. Tickets cost just $7 (Keiki free). To find out more visit www.MauiEarthDay.org , call 268-1211 or email coordinators Bruce & Satya Douglas at info@MauiEarthDay.org. Volunteers, organizations and vendors, call to get involved. No drugs please. No alcohol. Be conscientious, carpool, bring your own cups, plates and utensils and most importantly, come together & enjoy.